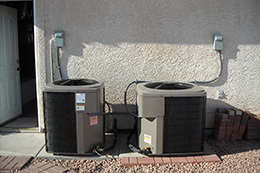 Air conditioning companies are important to being comfortable, specially in the southern states where the humidity and heat can easily get out of control. Not even nighttime is refreshing enough sometimes. Have you ever stepped out in the middle of a summer night and found that the air feels like it hasn’t even remotely cooled down? Well, that’s why most homes now come with a built in AC unit... and that’s why Charlotte AC repair is so important to leading a comfortable lifestyle. Whether your unit is broken or you want to make sure that it doesn't break in the near future, we’re here to help. Sometimes you just need a little maintenance appointment to make sure that everything is running smoothly after a long summer or winter. We understand that keeping everything intact is vital to staying comfortable and not losing your mind if it breaks down suddenly. Nobody likes having to deal with a sudden breakdown – and it never seems to happen when everything is comfortable, does it? Usually we end up needing Charlotte AC repair services in the middle of the day or in the middle of the night. It either turns our day for the worst or wakes us up covered in sweat. Charlotte AC repair services are here to make sure that you are well-prepared for such an event, and we can even help you avoid it for as long as possible with a maintenance appointment every few months. We can make your life more comfortable.